This entry is about technically advancing your hiking equipment with a device allowing you to summon help from the trail when you need it. I, like many people depend on my GPS and cell phone to summon help should the unexpected occur. Even in my area of Florida, with its abundance of cell towers, I have encountered areas with no coverage. Should an accident or an animal attack take place, I could be out of luck. My only hope would be that someone might come across me to provide assistance before the "worst case scenario" occurred. No one plans to experience a mishap or an emergency. You might be thinking, "need help? not me!". Well I know of at least three incidents where people needed to be rescued. First, was discovering upon returning to the car that the keys were missing. In a second situation, the person fell and broke a bone and could not move. Third, the person got stuck in muck so deep they couldn’t get out. In all cases they had cell phone coverage and a GPS, so by dialing 911 the sheriff’s department came out to save them. Now if they had been in a cell phone "blank" zone, they might not have been saved at all! ***Incidentally, the car keys were found without having to involve the sheriff. I have stumbled across many slithering creatures during my outward bound experiences. Some snake varieties were poisonous; water moccasins, diamondback rattlers, coral snakes, pigmy rattlers and they gave me a scare. I might have been unfortunate to be bitten by anyone of them - whether it would warrant a 911 call, I’m not sure. I also have been pretty close to some large gators that could have decided they didn’t like me. Oftentimes very large hogs have crossed the path in front of me, their behavior can be unpredictable. One of the worst things that I have encountered is Florida muck - you can find yourself stepping into it and not being able to get out - a very frightening feeling. The other is the random Cyprus tree knee. On these, I have stumbled and fallen "flat out" on a few occasions; always a little concerned I might become impaled as I am heading toward the ground. I was encouraged to get a Personal Locator Device (PLD), so I started researching the various designs. It seems the price range is quite extensive - from around $100 to thousands. I certainly didn’t want to spend a lot of money; it wasn’t as though I was going into the mountainous regions of San Bernardino or the Australian Outback! After reading reviews on the Internet I decided upon the following devices for a trial run. ***Disclaimer*** I am not a paid endorser of either product, only commenting on my direct experience with these devices. Both units use satellite systems as their communication method, not a cellphone network. Thus, if you can see the sky, you should be able to send out a signal. 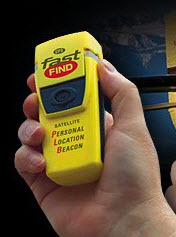 The "Fast Find GPS PLB" is a true PLD - it has one function and one function only - that is to send out an emergency signal when you are in trouble. You do have to do a little preparing before sending a signal, but it does work. The unit has to be registered with the IRBD before it can be used. So, if you get in trouble, pull the antenna out, push the button, help should be with you soon. It has a built in GPS and also sends out a beacon to the rescue people when they are in your area. Once used, it must be reset before it can be used again. 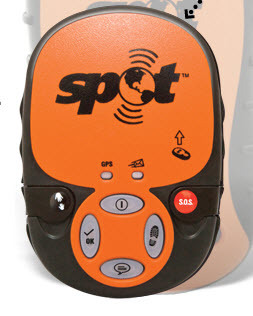 The "Spot 2 Satellite GPS Messenger" is more of a "low class" PLD. It should do the trick, but I feel not as well as the "Fast Find" unit. For me there has been as much as a 20-minute delay from sending to receipt of the signal. So "buyer beware" if you believe 20 minutes may be of significance to you. It is very compact and does send all its signals using satellites. It has the ability to send out three message types (special buttons on the device) to a central computer. The central computer will forward those on to emails addresses and/or mobile phones of people you have defined in its database. One message might be used to report that you started/ended a hike to your friends. Another message might be used to report your location along the trail. Both message types contain the GPS location from where they were sent so the receiver can use that data to pinpoint your location. A third option is a message to send to a friend asking for help - this would be used if you wanted your friend to come and help you. The SOS / 911 function sends a signal for a rescue unit to come and help you. The SOS / 911 function is used in the event of a life threatening or other critical emergency to notify emergency services of your GPS location and that you need assistance. The GEOS International Emergency Response Center alerts the appropriate agencies worldwide - for example contacting 9-1-1 responders in North America and 1-1-2 responders in Europe. I ordered and looked at the “Fast Find" device, it is very complex and I feel it would get help if needed. The thing I didn’t like about it was the single use idea. I think that would be fine if I was using it on an occasional hike or mountain climb, but I would be using it many times. I sent it back and ordered a Spot 2 because I liked the idea that I could use it all the time, sending emails/Text messages to friends and family with status updates of my hikes. I have used it for a while now and find it to be a so-so device. You are never sure that after sending a message that it was actually sent. The email light flashes, but that just means that it is trying to send the email, not that it ever got sent. I actually had to return the first unit I had because it hardly ever connected to a satellite (test your unit extensively if you buy one). I did keep the second unit I received and do use it for reporting the status of my hikes. I hope I never have to use the SOS/911 function. So in conclusion, I highly recommend you consider owning one of these devices or any of the others out there. Adding "self security" measures can boost your confidence in your safety and elevate your hiking experience. It is a nice feeling knowing that you are connected "out there" and if the need arises, you can summon help. Cellphone coverage cannot be depended upon.